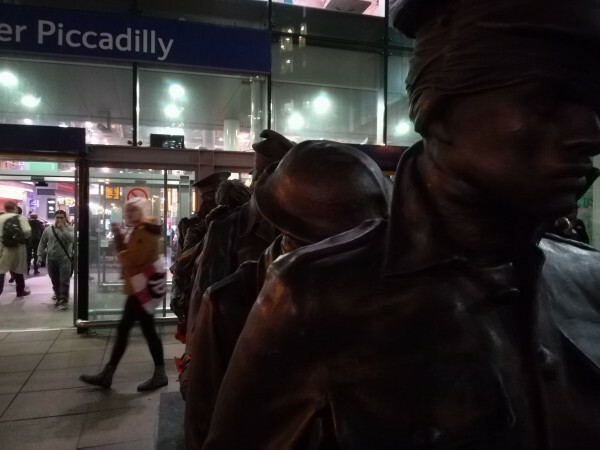 The statue depicting seven blind soldiers from the Great War was unveiled outside of Manchester Piccadilly station in support of Blind Veteran’s UK charity. The bronze sculpture displayed at the entrance of the station embodies the inspirational stories of seven soldiers whose bravery and courage inspired its creation. The artwork is dedicated to more than 3000 Great War veterans who were affected by blindness. Gas attacks and shrapnel were some of the causes of blindness in WW1. Commuters passed by as the Countess of Wessex unveiled the sculptures. "I wanted people to have their own interpretation of each statue. I saw people interacting with them and each person had their own emotional response. I wanted them not only to think of WW1 but of their own problems and illnesses". The statue is of seven blind soldiers and each man walks with a hand on the shoulder of the man in front. A soldier with partial sight guides the group from the front. The status is reminiscent of John Singer Sargent’s war painting ‘Gassed’. "It’s an honour for Greater Manchester to permanently host this sculpture – it’s ultimate message is one of camaraderie, the journey of rehabilitation and ultimately, the ability to overcome adversity". Blind Veterans UK is a charity that was founded at the end of the First World War with the aim to support wounded soldiers returning to Britain with impaired vision. Today, the charity continues its mission in supporting service men and women suffering from blindness with rehabilitation and integrational training following their de-commission from the armed forces. 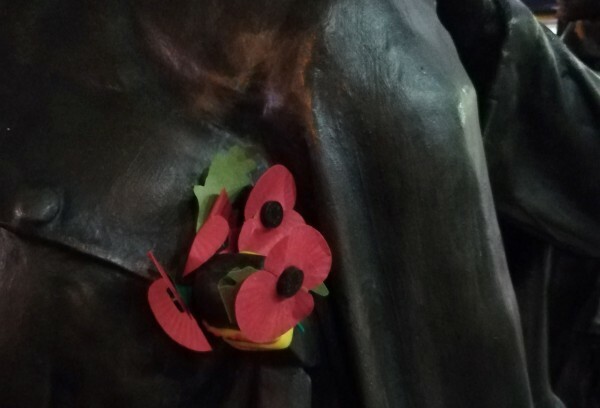 The statue was inspired by the stories of seven soldiers who were in 'theatre' during the Great War. All seven were former clients of the charity, who were aided in their re-entrance to society. Angus Buchanan joined the British army in 1914 at the age of twenty and served with the 4th Battalion, South Wales Borderers. He saw action in Gallipoli and Mesopotamia. Aged 21, he was commissioned as a temporary Captain and was wounded on two occasions whilst serving in the Dardanelles in North West Turkey. Despite his injuries, Buchanan continued to serve. He later saved the lives of two of his men for which he received the Victoria Cross. The highest honour that can be bestowed upon a British soldier. Before Buchanan could receive his medal, he was wounded a third time at the Falauyah Lines at Mesopotamia. Because of his injuries, he lost the use of his eyes. After leaving the army in November 1917, Buchanan came to the Victory over Blindness charity. Through the aid of VOB, Buchanan learned Braille and typewriting which enabled him to return to Oxford where he studied law. Buchanan later became a solicitor. Despite his injuries, Buchanan rediscovered his passion for sports and became a prominent member of the VOB rowing team. Angus Buchanan's story was one of seven that inspired the statues. Thomas Van Zeller served as a tank commander during the Great War. On March 23 1918, he was commended for successfully covering the withdrawal of troops. He received the Military Cross for conspicuous gallantry. Thomas would later be the sole survivor of his tank crew after it was destroyed in action. He lost one eye, his vision in his other eye was forever damaged and his face was permanently scarred. When returning from the war, he underwent twenty reconstructive surgeries in order to salvage his vision. Later, he suffered a stroke which led him to seek assistance from the charity. His memory is commemorated through the statues. Thomas’ son, Peter Van Zeller joined the RAF and later transferred to the army. He served during the D-Day landing in France. He lost the use of his arm after being shot by a sniper. His hand was replaced by a hook. Peter began receiving assistant from Blind Veterans in 2016 after losing his sight to glaucoma and macular degeneration. Thomas Van Zeller was also an inspiration behind the creation of these statues. For more information on how to support wounded Veterans visit Blind Veterans UK.